I think about blogging every day. But as you can see from the date of my last post, and the date before that, the blogging isn’t actually happening every day. But not because I’m not writing. My journal and writing notebook and random pieces of paper around the house are full of my ramblings and thoughts and processing. Even my What’s App conversation threads are evidence of my attempt to figure out my life. It’s just that I can’t seem to pull together anything cohesive that seems worthy of a reader’s time. And yet, for some strange reason, my heart aches to lay itself bare. So, I’ll leave it to you to determine if this is worthy of your time, but this is where I’m at. The preacher at our church spoke on Deuteronomy 8 this week. And though I hope my current situation won’t last 40 years, (Lord, have mercy…) I have to say that everything else about this passage perfectly sums up what I’m experiencing right now. 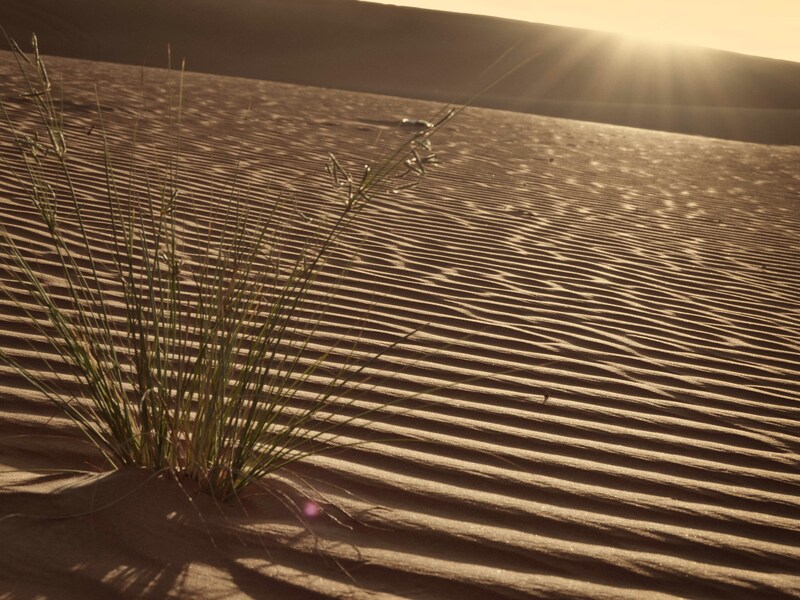 *Led by the Lord to the wilderness: Not just because this is literally the desert, but because my life has been stripped of so much of what was once most nourishing. *Humbled: “I am a flower quickly fading, a wave tossed in the ocean, a vapor in the wind.” I’m grasping a sense of my smallness in this big, beautiful world, and also my very limited understanding. Also, I thought I knew stuff and I thought I could control things. Mm hm. *Tested: I’ve faced spiritual, emotional, mental, and relational challenges before, but this is the big leagues. At least it feels like it. It’s probably still the minors and I’ll chuckle to myself in a few years. *Exposing my heart: Do I really trust God, the way I thought I did? *Hungry: Hungry for my family and friends. Hungry for some idea of my future. Hungry for direction. Hungry for clarity on so many things. Manna: The word manna, in Hebrew meant, “What is it?,” because the Israelites literally had no idea what it was. God has satisfied my hunger in ways I didn’t expect. But, with a life that is unrecognizable to me. The Word of the Lord: More than ever, this is my daily bread. Not because I wasn’t reading it before. But because, in a rich and plentiful land, the promises of God were the cherry on top. But in the wilderness, the promises of God are my life line. 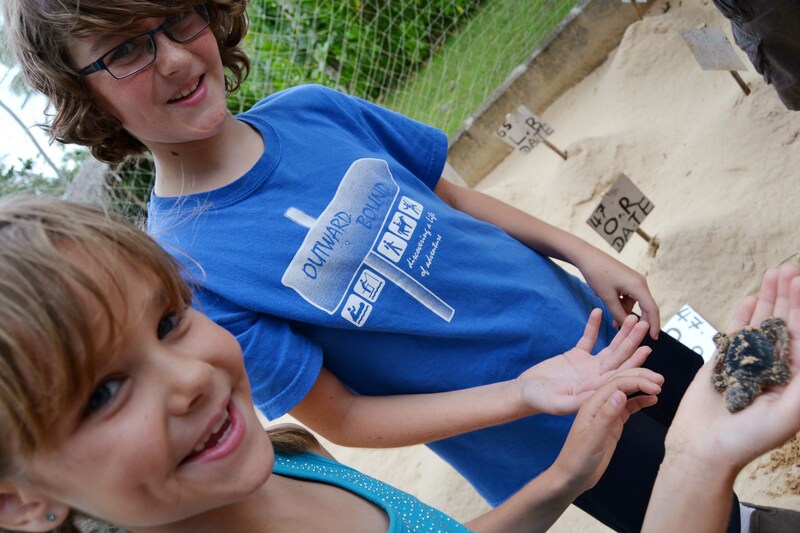 This entry was posted in Living On Mission, Processing Life. The first day of a new year offers a chance to reflect and dream. What has the last year been like? What does the new year hold? What do I hope to see happen in my life? The google will tell us that travel is one of the most common goals and aspirations people have on their resolution lists and dream boards. I know that’s true in my life. I’ve always had dreams to travel the world. And why is that? What are the underlying reasons I have for wanting to see new places? I’ve been thinking about this since we left Canada, but more specifically, since we wrapped up our Christmas trip to Sri Lanka. I think if we’re honest, some of the reasons we long to travel are not worthwhile. It seems cool to say we’ve been to some exotic place, far from home. Somewhere few of our peers have seen. It sets our life apart, somehow. As if it expands our importance and justifies our existence. We would likely never voice this, or maybe even be aware of it, but when a well traveled person talks about their experience, it’s hard not to feel like your life is smaller and in some way, inferior. That’s what the online “100 places you have to visit before you die” type lists have done to us. You know those things that go around Facebook where you check off all the countries you’ve visited and we unwittingly compete to see who has the biggest number and therefore, the biggest life? But what does a number ever tell us about a life? Nothing. Someone can travel to 60 countries and have an impressive looking map checklist, but not have allowed it to change them in any way. Another person can live in one country their whole life, and never leave, and grow more and more in compassion and love and appreciation for people different than themselves. Who’s life is bigger and who comes out ahead? No one can say for sure- life is not measured in numbers. It’s measured in things like love and impact. So, what then, are the worthwhile reasons to travel? 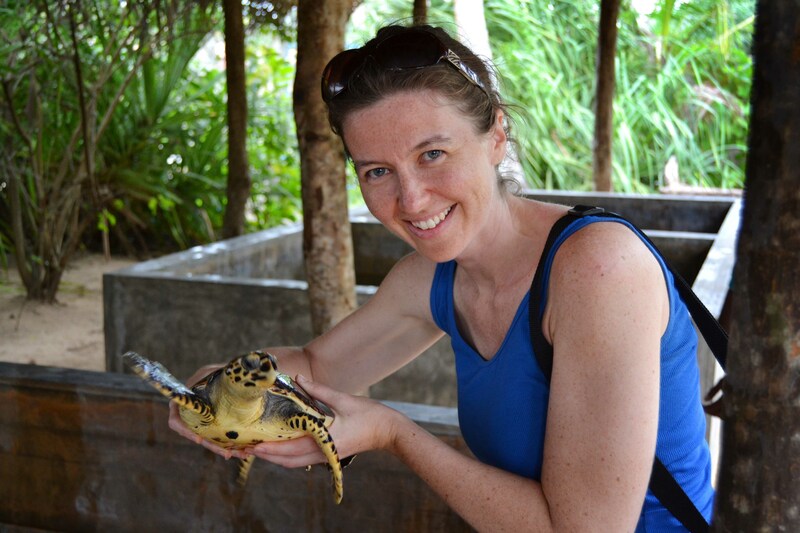 Why is travel still on my list of goals for 2015? My hope, as we visit new places and countries, is that we will be transformed. That our understanding and appreciation of different people and cultures will grow. That we will learn to love people more deeply, judge people never, and move through our lives with more compassion. That we will marvel at the glory of God through his beautiful creation, and at the ingenuity of humanity throughout the ages. And that along the way, we’d have some fun and make a lot of great memories together as a family. But note, all of those goals can be achieved without ever leaving our home country. That we have the opportunity to do these things in another country is indeed a privilege, but in no way makes our lives more exciting or more valuable. So, as I post pictures and stories from this trip, and any that follow, I pray that this would not spark in anyone a twinge of jealously or a sense of smallness, as it once did for me. I pray instead that you would hear of the growth and change in us, and be inspired to experience the same, wherever life has you. 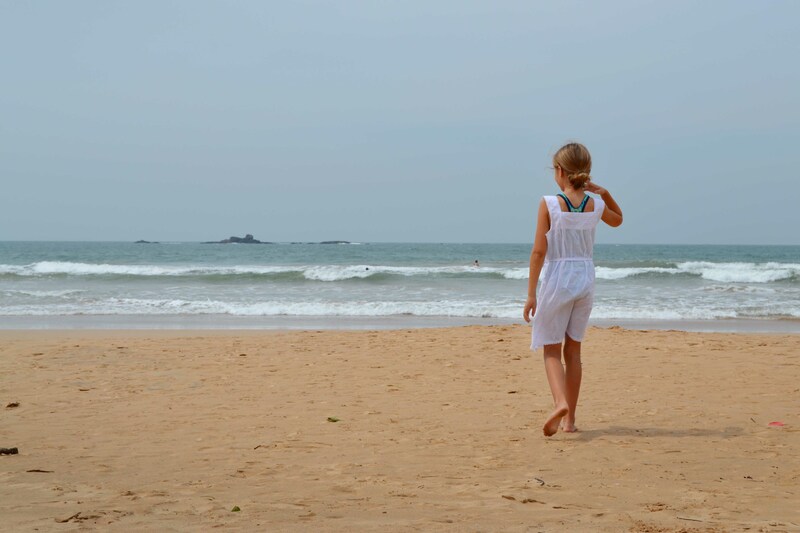 And Sri Lanka was indeed, a growing experience for us. I understood, for the first time during this trip, that traveling is different than vacationing. The goal of a vacation, for the most part, is relaxation, fun, entertainment, and generally having a break from the challenges of life. The goal of travel, as I mentioned above, is much deeper. Seeing, experiencing, reflecting, changing. 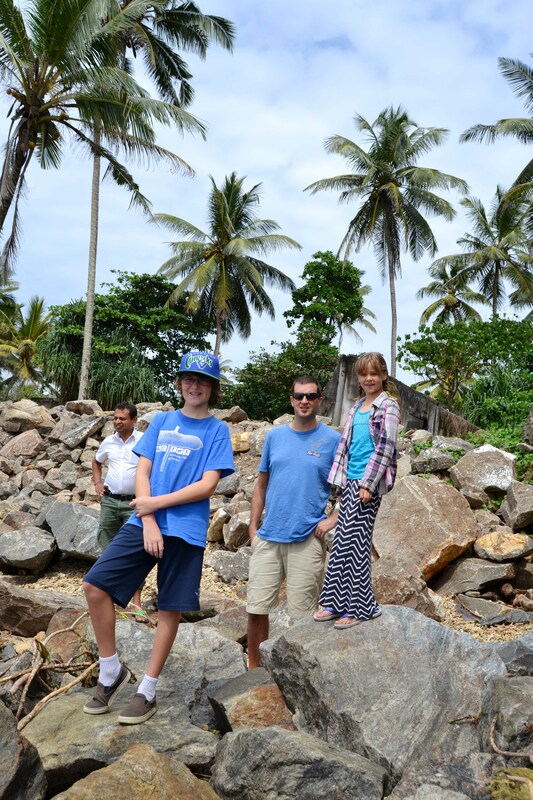 So while we had some vacation-y moments along the way, this trip was all about travel. The tricky thing is, our life is one colossal challenge right now. Every day is a learning curve and a bit of a mental battle. Right when we could use a vacation the most, we find ourselves instead, perfectly situated for travel. 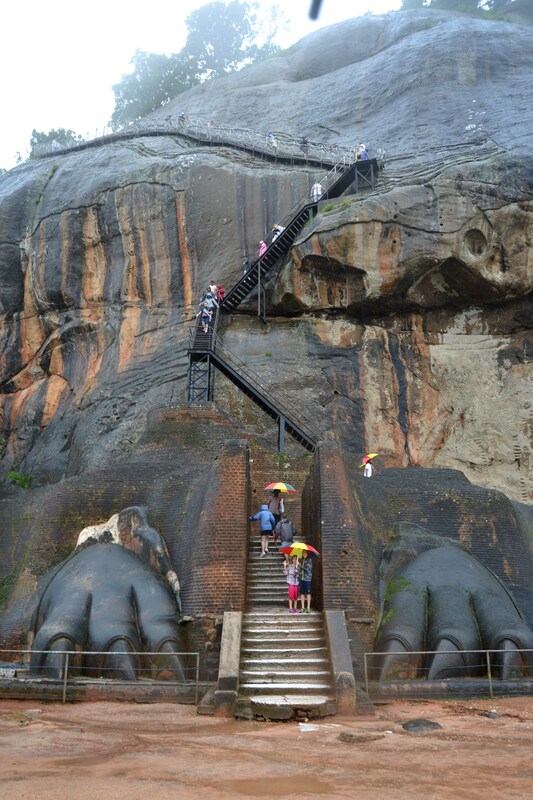 So, we take a break from our challenging new lives to challenge ourselves and our perspectives with a trip to Sri Lanka. Seriously, I don’t think we’re even going to recognize ourselves in two years. 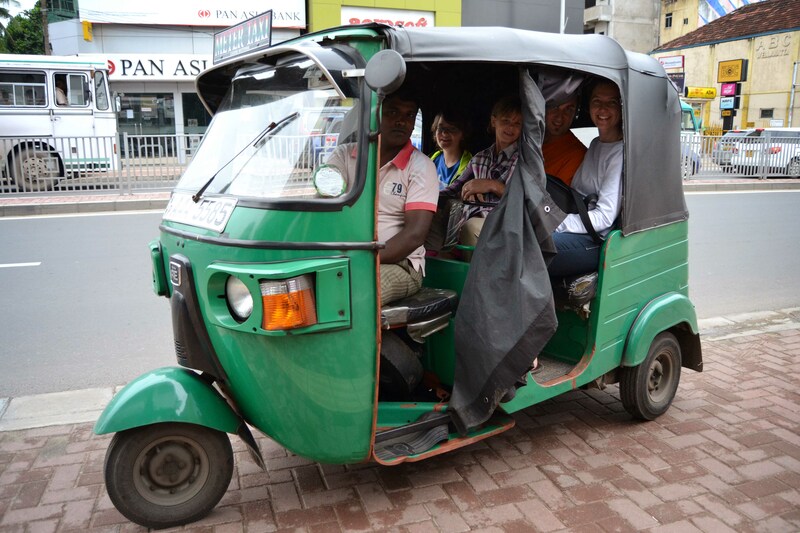 Our first of several tuk tuk rides. 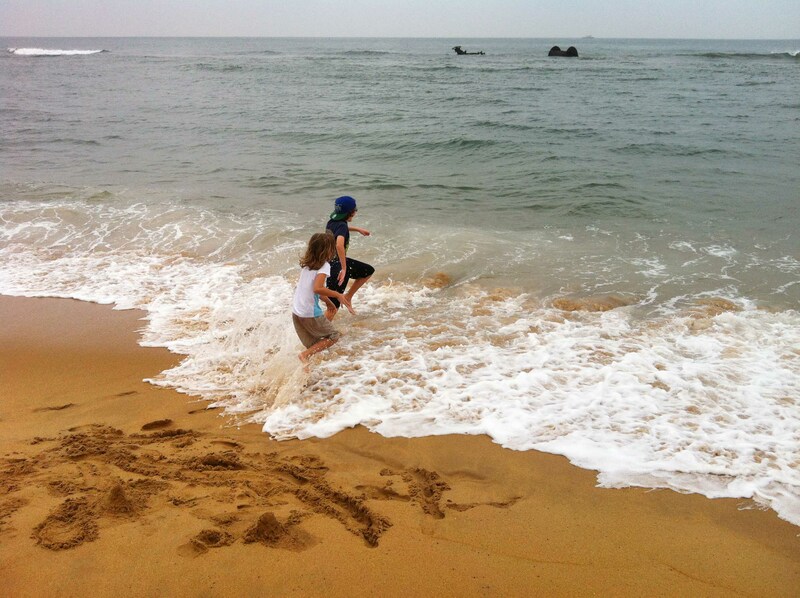 The kids first run into the Indian Ocean, fully clothed. 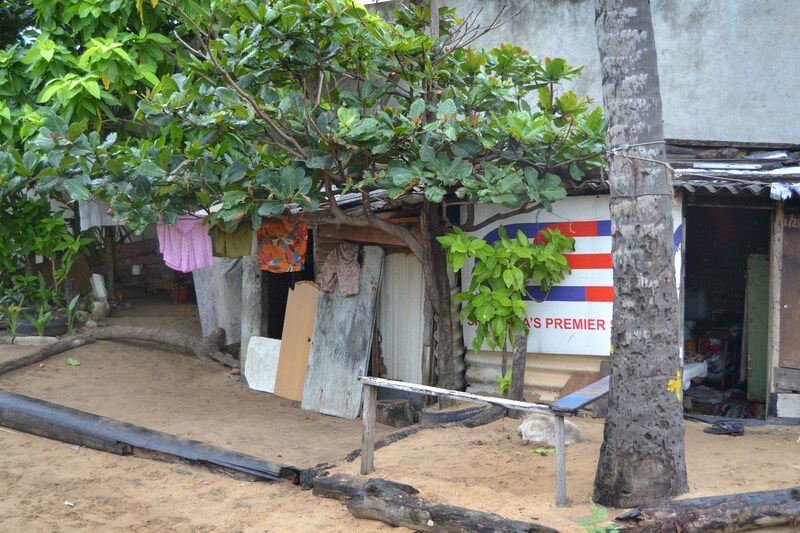 Two family homes near the beach. 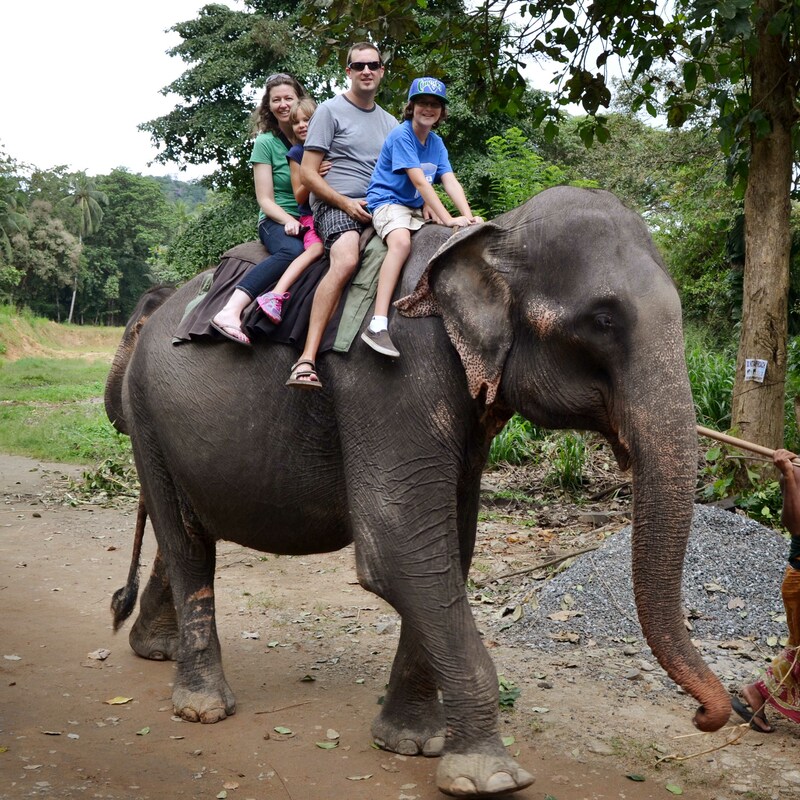 Riding Manika at the Millennium Elephant Foundation, which rescues elephants from abusive situations. 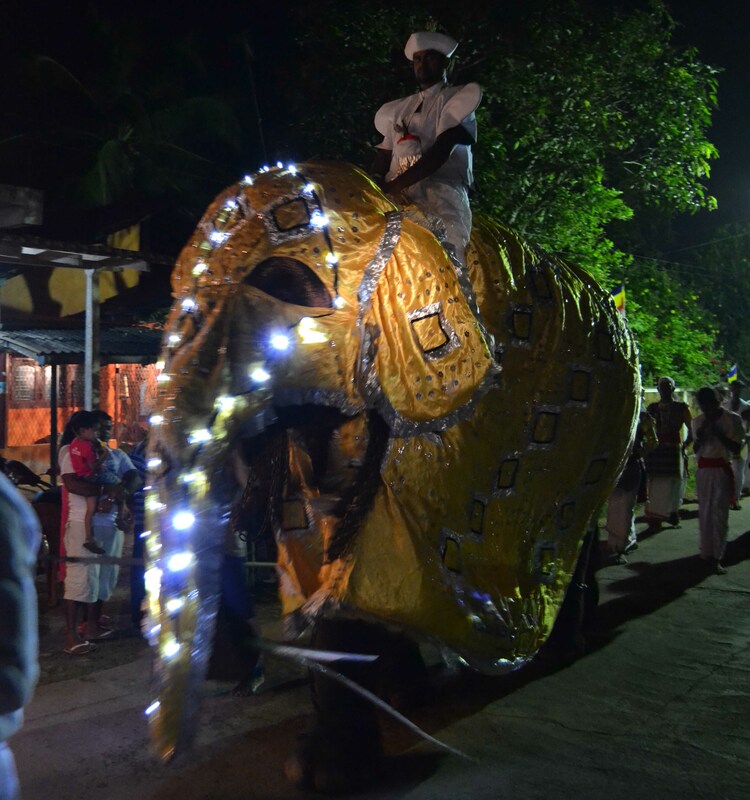 Now, they’re like union elephants, who work from 9-4, with multiple long breaks, and a maximum number of rides. They dance in the river. Seriously- I have video of it. So cute. 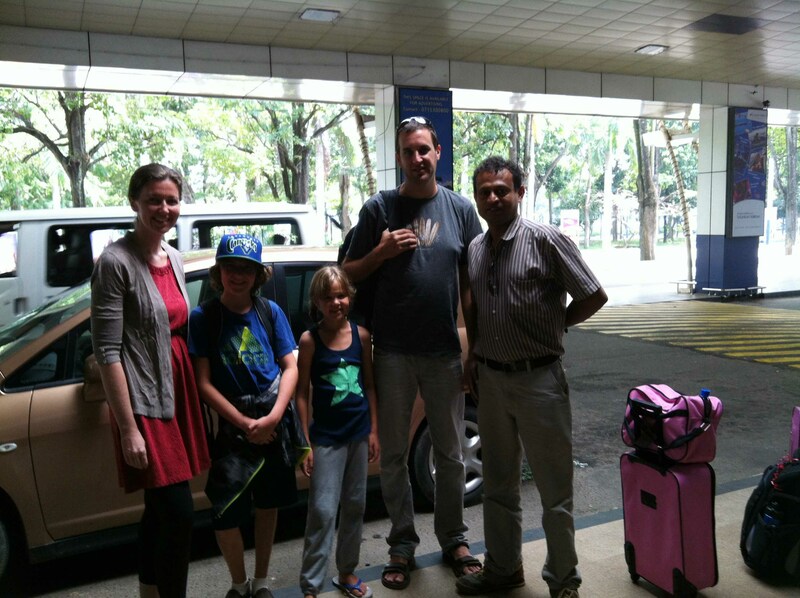 This was our first day with our driver, Seneca, pictured here with us. 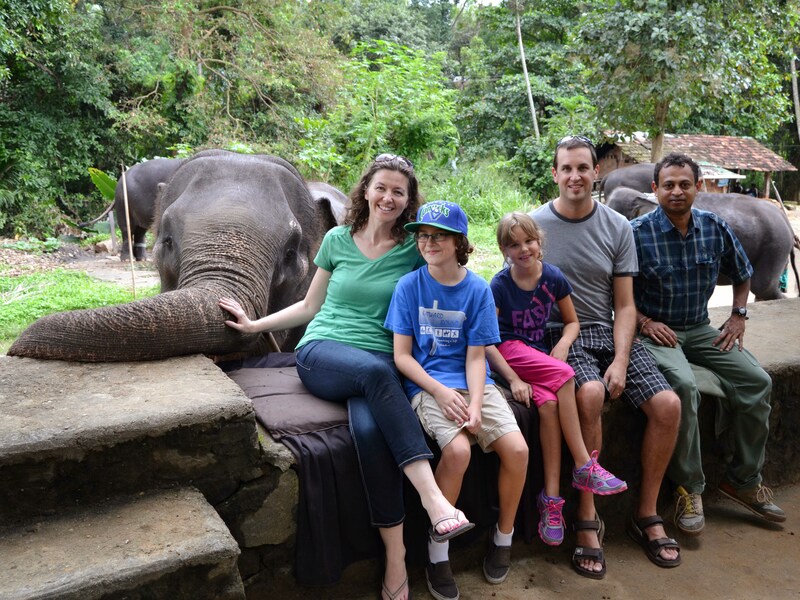 We didn’t know yet how awesome he was, but he was excited as we were to visit the elephants. 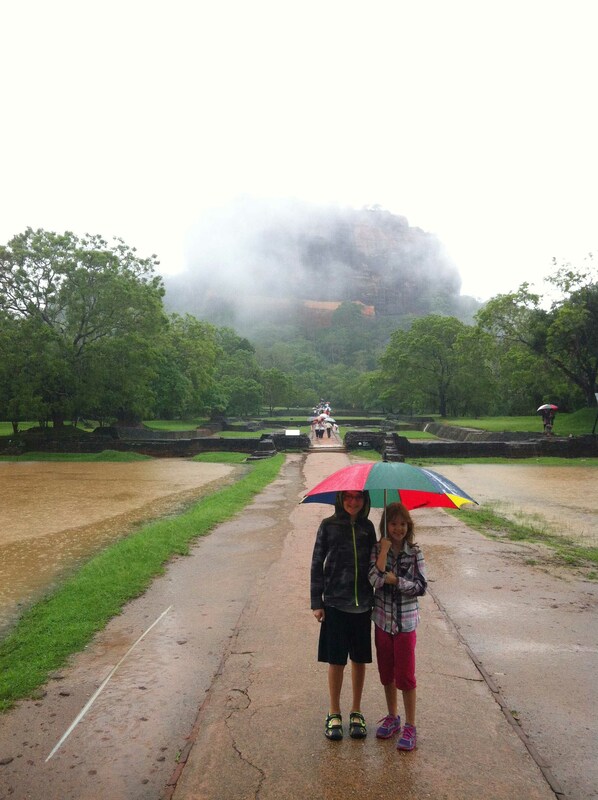 Our rainy day visit to Sigiriya Rock, which despite the opening of the heavens with water, was magnificent. 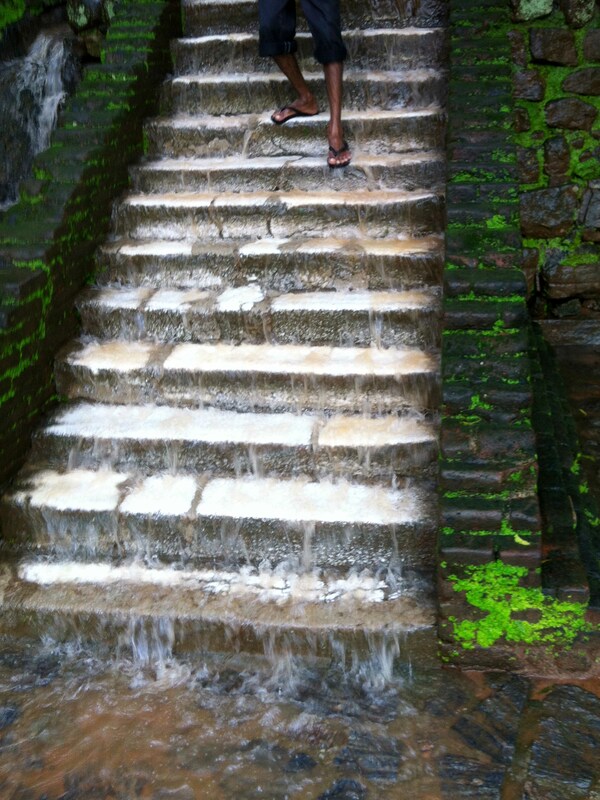 The water pouring down the steps. Our feet were…wet. Less water near the top. 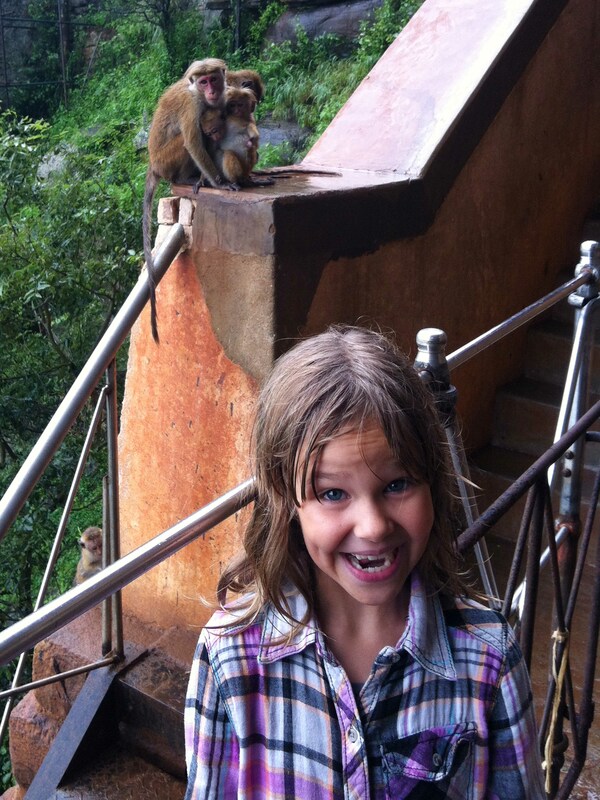 She was kind of excited to see monkeys. 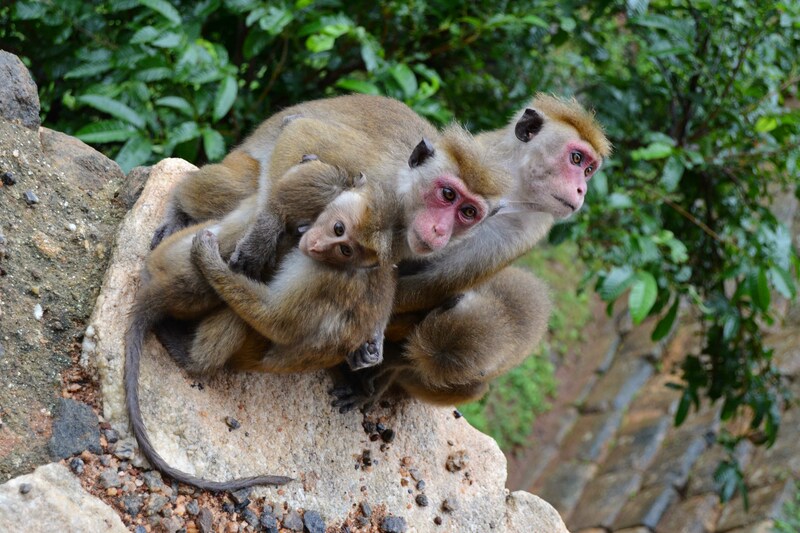 Monkey family photo. Teenager monkey on the right was giving attitude and refused to look up and baby monkey on the left was scared and finding solace in his siblings arms. 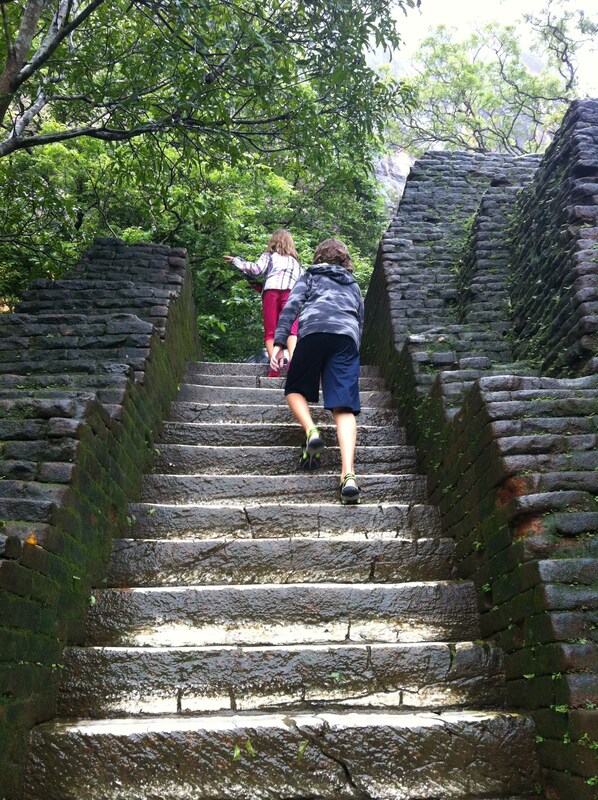 It’s a steep climb. I didn’t have the guts to pull out the camera on the scariest parts, because I was focused on not slipping and dying. Half way up, at the lion’s paws. Slippery stairs still to come. The steps to the palace at the top of the rock. 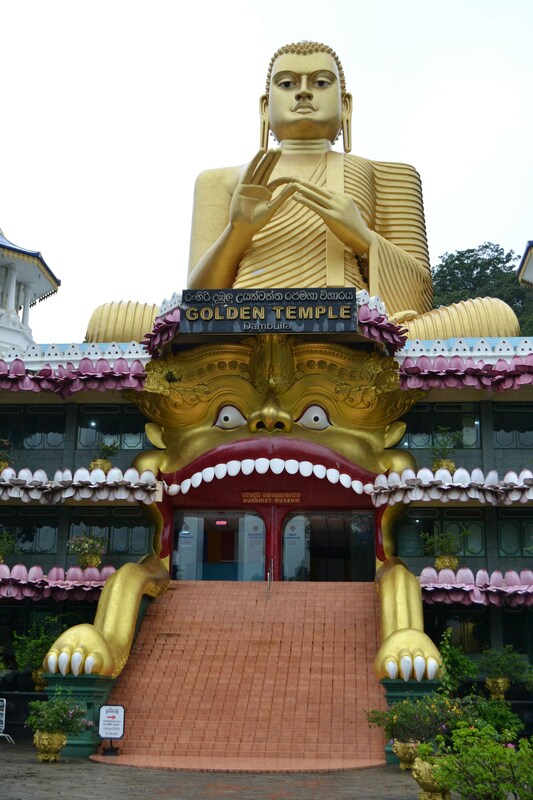 The biggest of thousands of Buddha statues we saw. 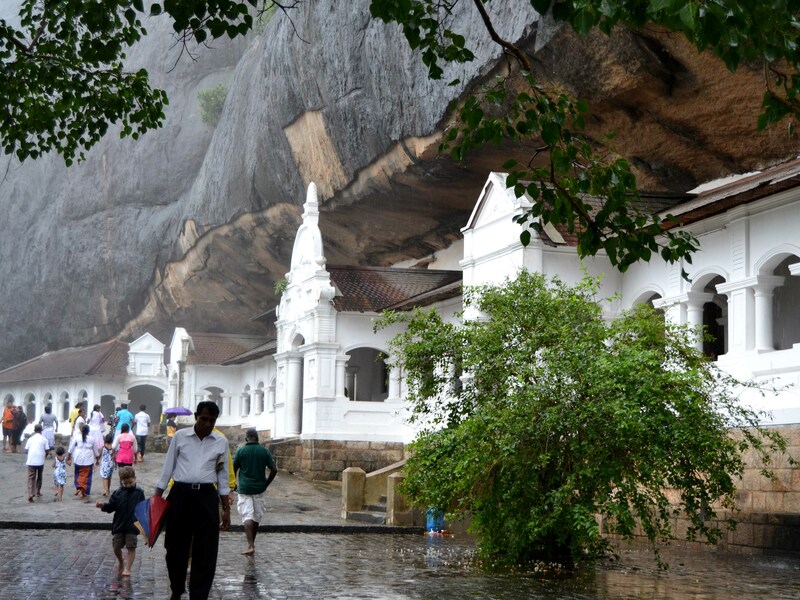 The Dambulla Cave Temples were monasteries in the middle ages for Buddhist monks. 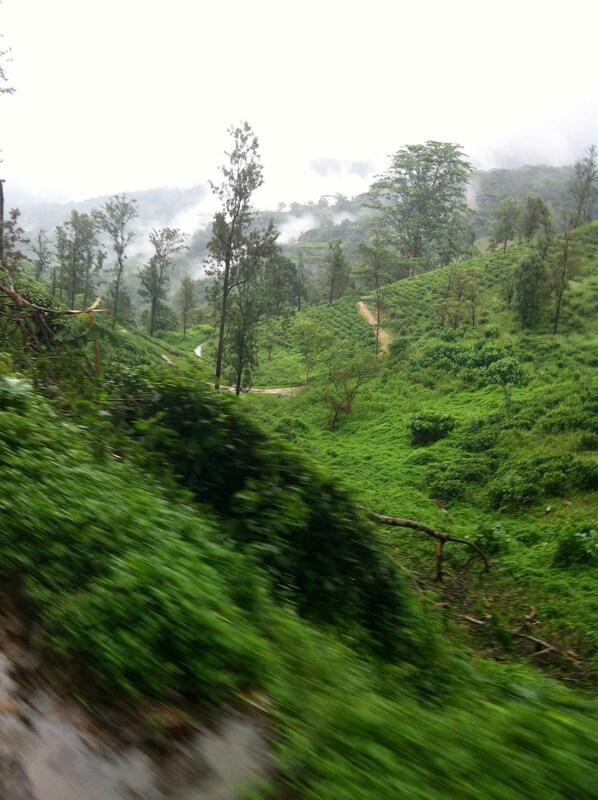 The best view we could get during days of traveling through gorgeous, lush mountains and valleys. You can imagine with us how beautiful it would be on a sunny day. 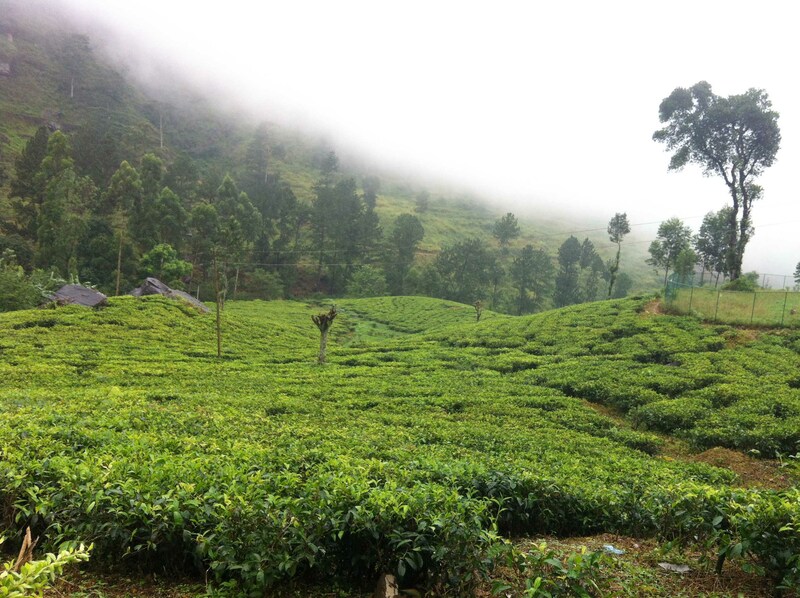 Miles and miles of tea plantations. 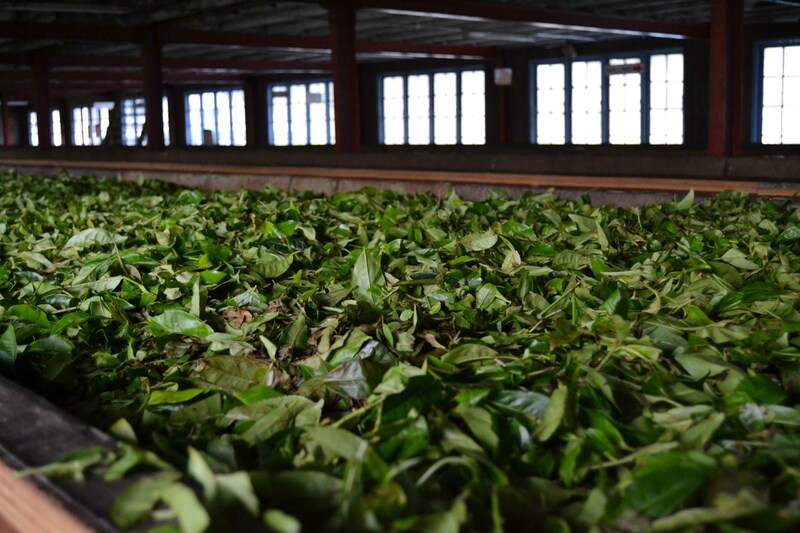 Tea leaves drying in the factory. 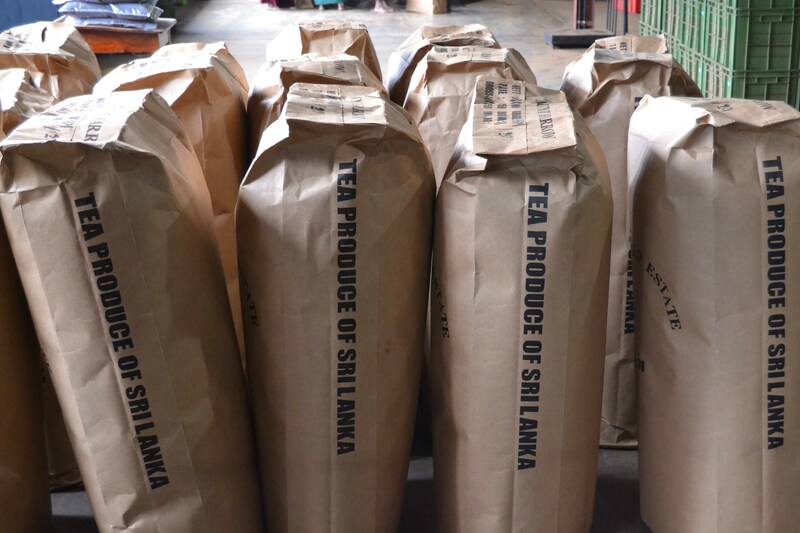 Sri Lankan tea is world famous, and it even managed to make a temporary tea drinker out of Dwayne. The smell in this room was heavenly. The finished bags are about 3 feet high. I thought of buying a suitcase just to take one home. Our Christmas Eve story could fill another post, so I’ll just sum it up with our favorite shot. 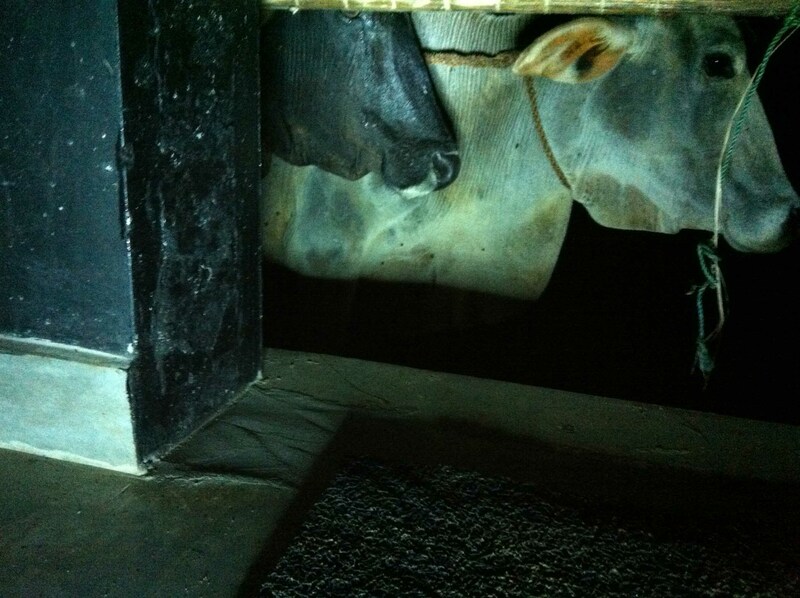 These are the cows peeking into our “room” (aka covered porch) at 5am on Christmas morning. We’ve never related so closely to the manger scene on as we did this year. It will be an unforgettable family Christmas memory. 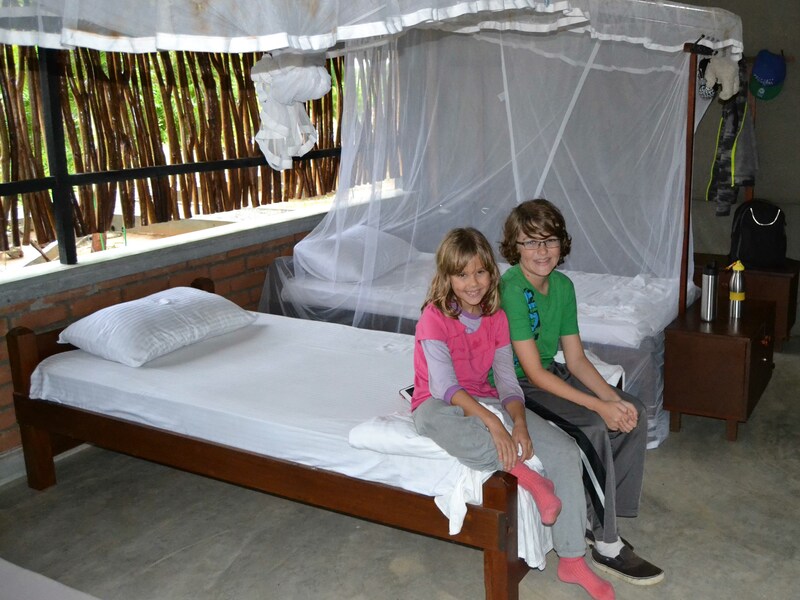 The kids in our hostel room on Christmas Day…right as we’re about to check out, a day early. 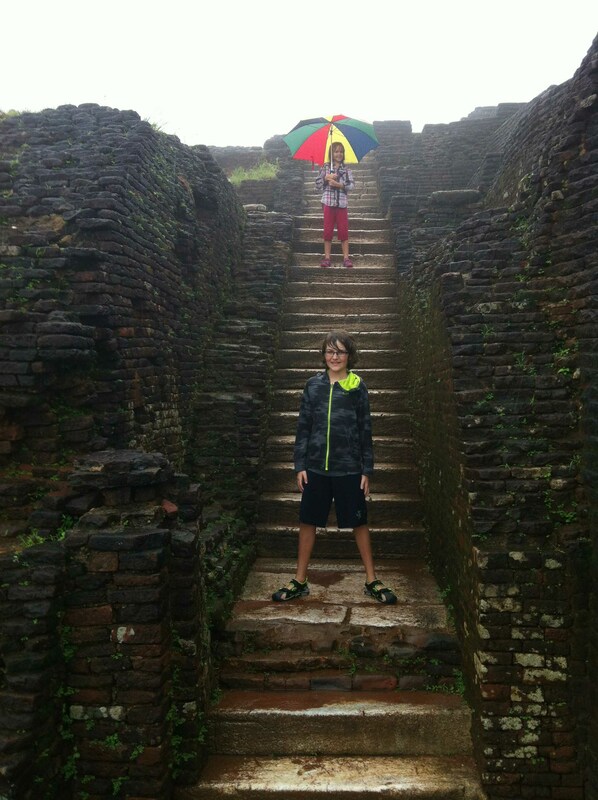 One night in the pouring rain, in a National Wildlife Park without walls or a door was enough for us. But look at these 2 troopers! They slept better than Dwayne and I. 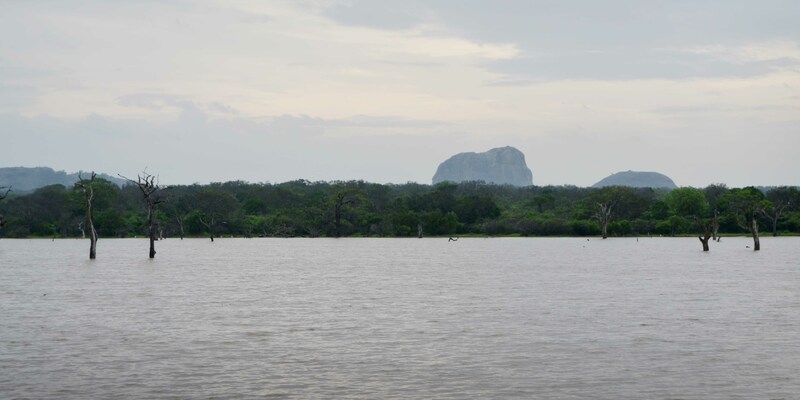 Elephant Rock in Yala National Park. 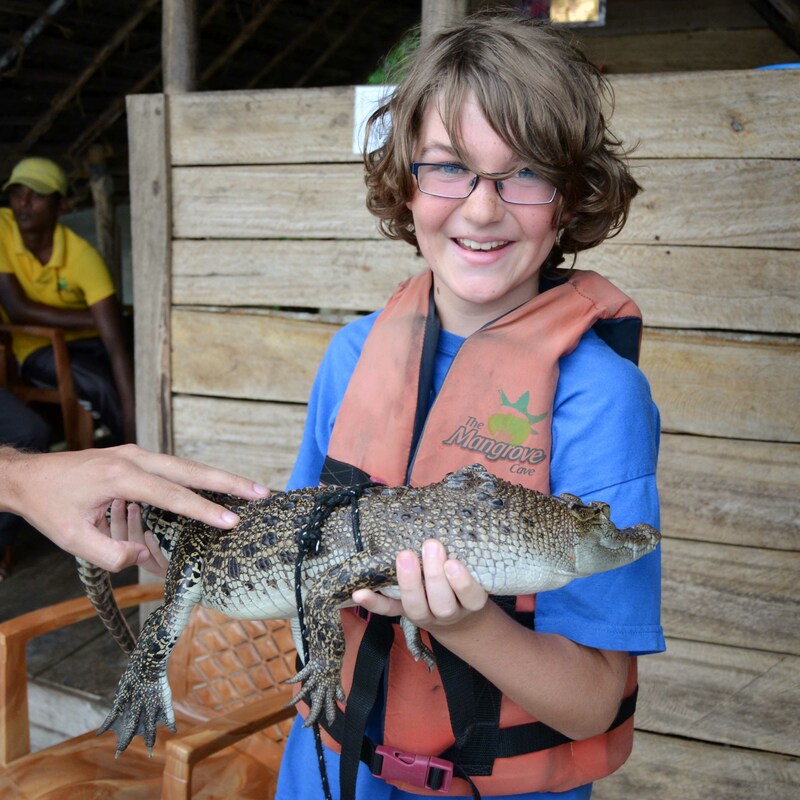 We went for a safari, but the pouring rain made it a bit of a bust. Too much rain means the animals don’t need to gather at their usual watering holes and therefore, are nearly impossible to spot. 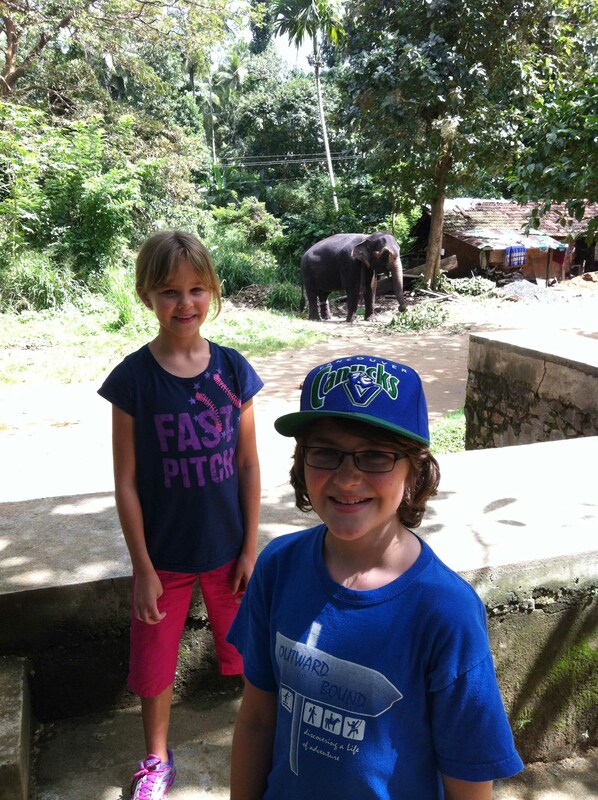 We did see a lot of water buffalo. And deer. And wild boar. And birds. Totally worth the 11 hour drive. 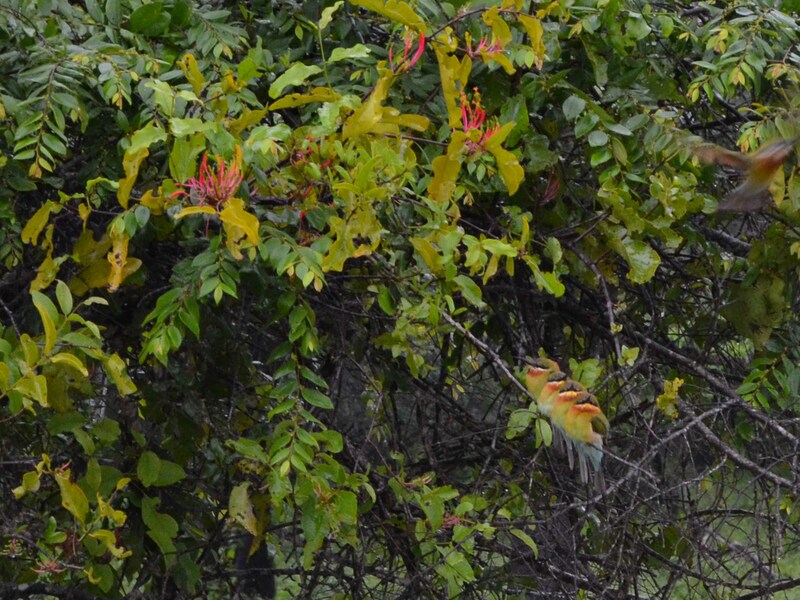 These 4 beautifully camouflaged birds are cute though, right. So worth it. 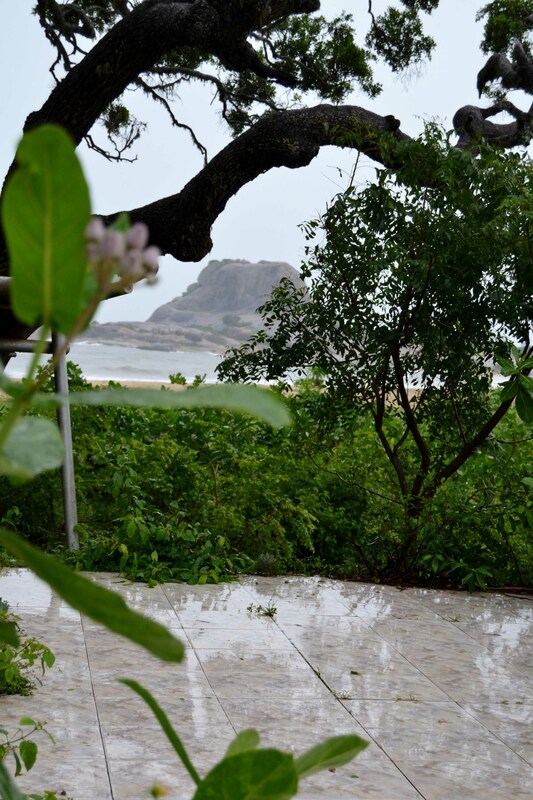 This photo is taken from the tile floor, which still remains from a hotel in Yala National Park that was washed away by the tsunami in 2004. There is a monument there to the 47 guests and staff members who were swept away that day. 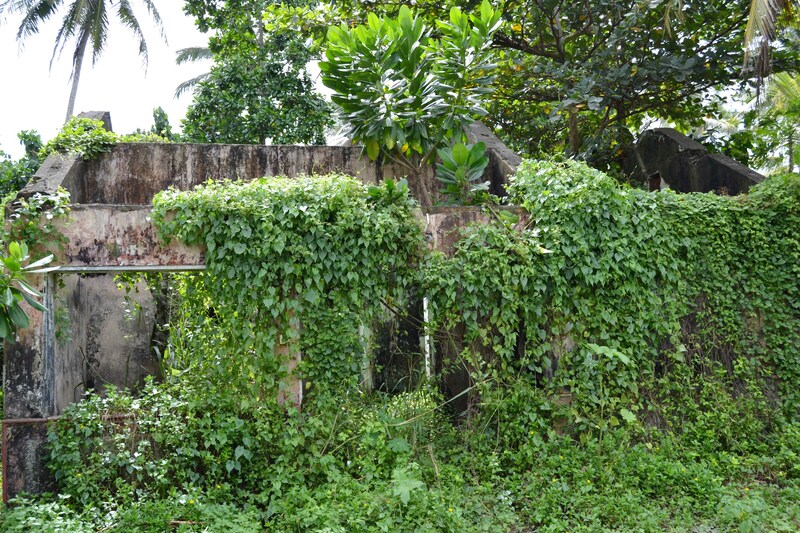 One of the endless abandoned buildings on the south coast of Sri Lanka, which were left ownerless after the tsunami. Hundreds of sad monuments to the devastation. These kind men were fishermen who were taking the day off to remember their friends who were lost in the tsunami. 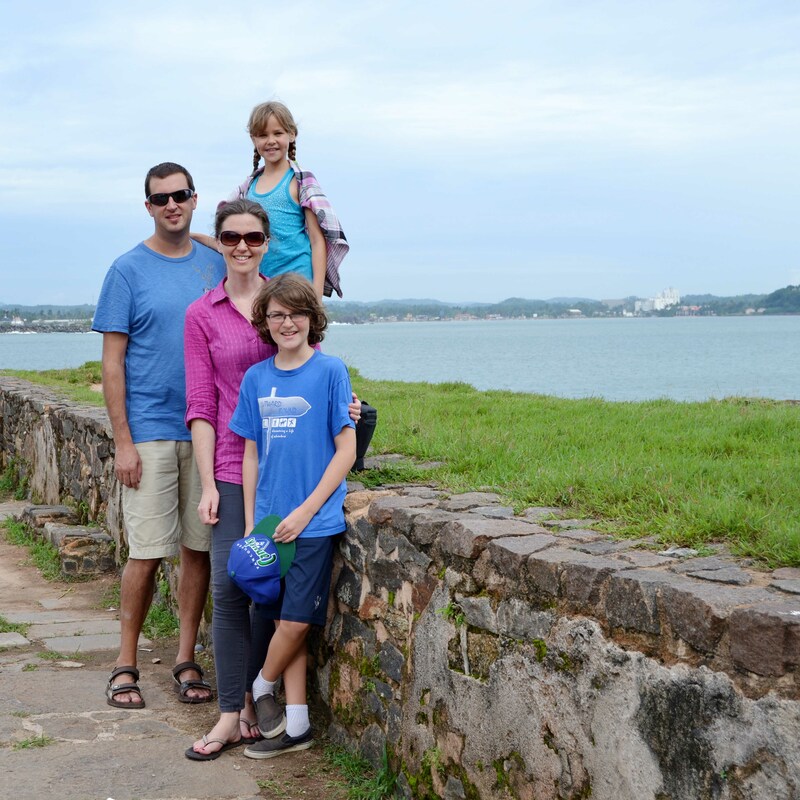 Family photo at the Galle Fort. Abby bought a cover up beach dress from this lovely woman, so we took their photo together. 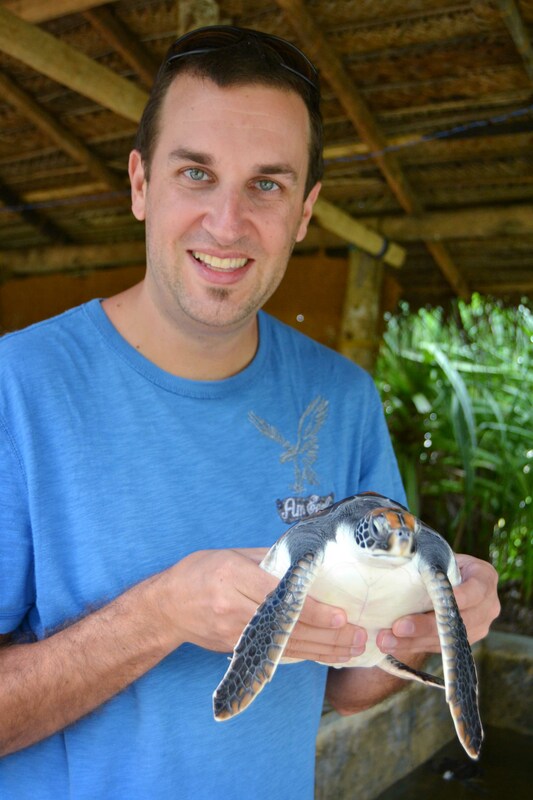 Huge family highlight at a sea turtle conservation site. 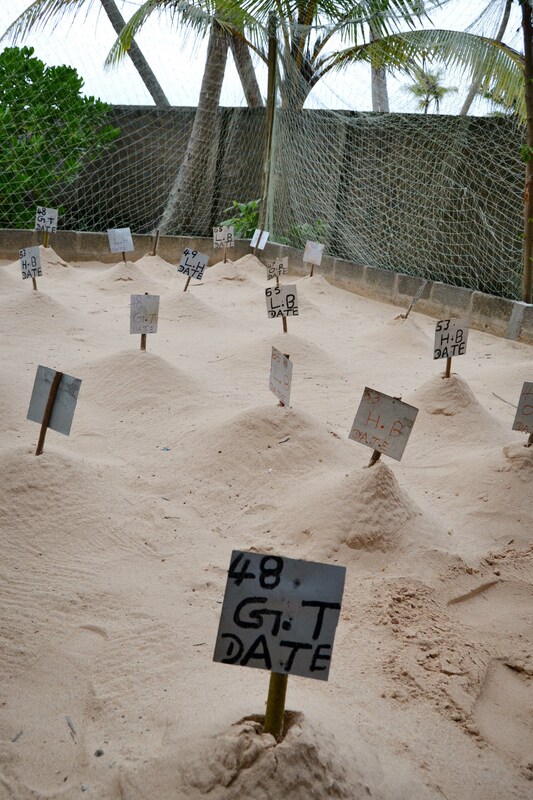 All these little piles are full of different kinds of turtle eggs, covered with a net to protect them from lizards and birds. 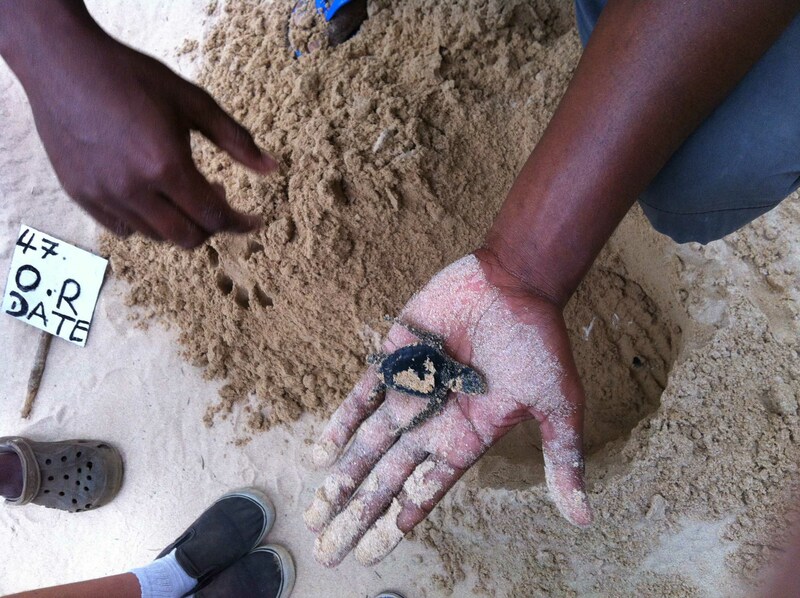 Newborn green turtle, just emerging from the sand. Oh the cuteness! He was already so strong. These little nuggets were 3 days old. We could have stayed here for hours. 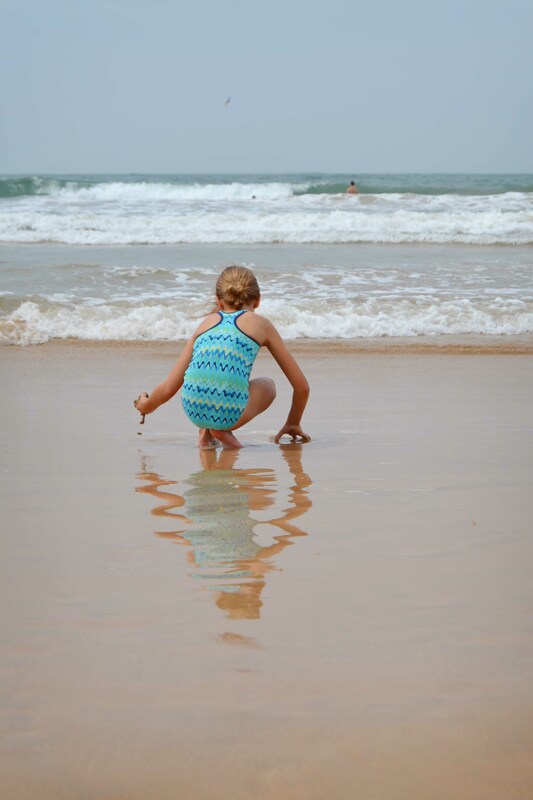 The rain cleared in time for us to have a few beach days at the end of our travels. The boys here are in the distance playing in the waves. At a parade put on by the local temple. 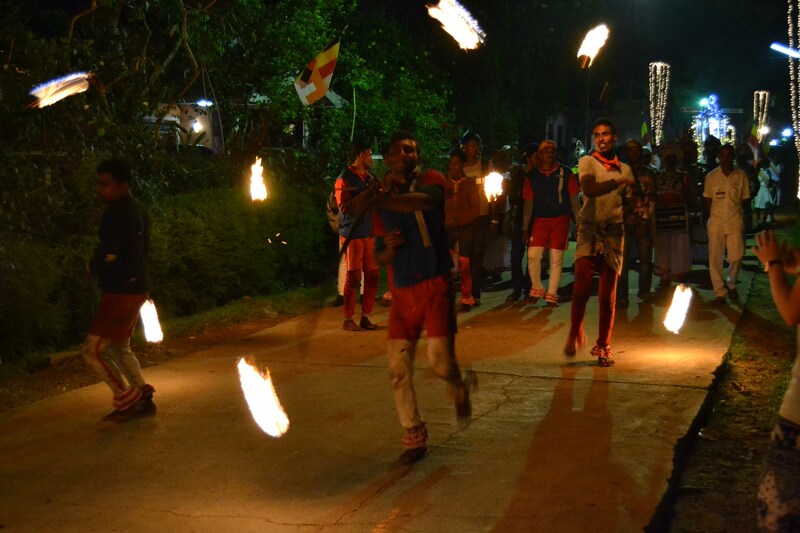 Fire jugglers, plate spinners, whip snappers, Kandy dancers, and sparkly elephants. Even more entertaining than the Stampede Parade. 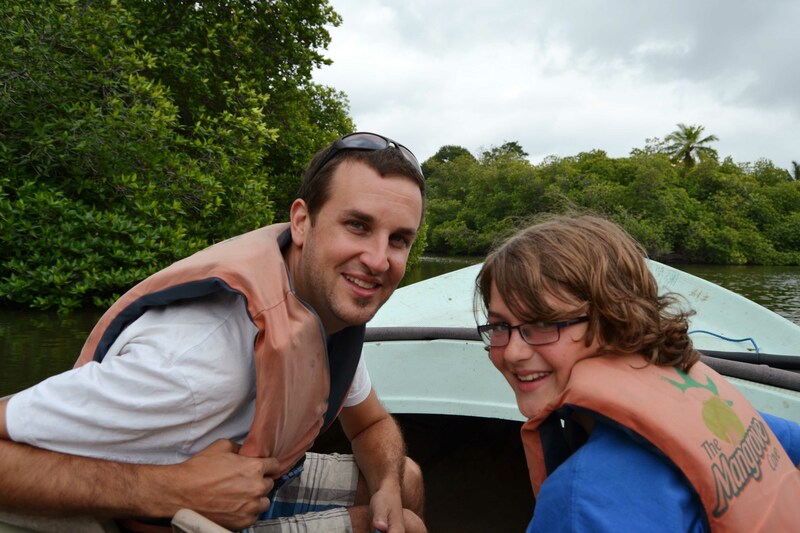 On our last day, we took a river safari on the Mada River. It was AMAZING! 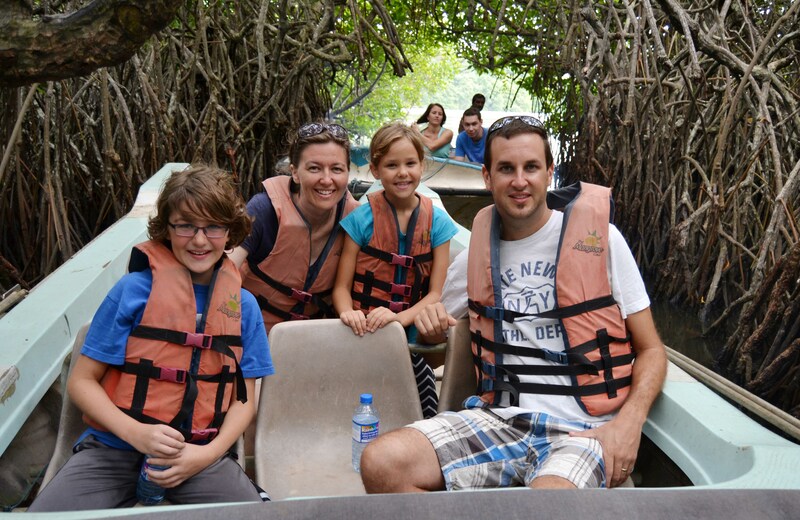 This is our family shot in the mangroves. 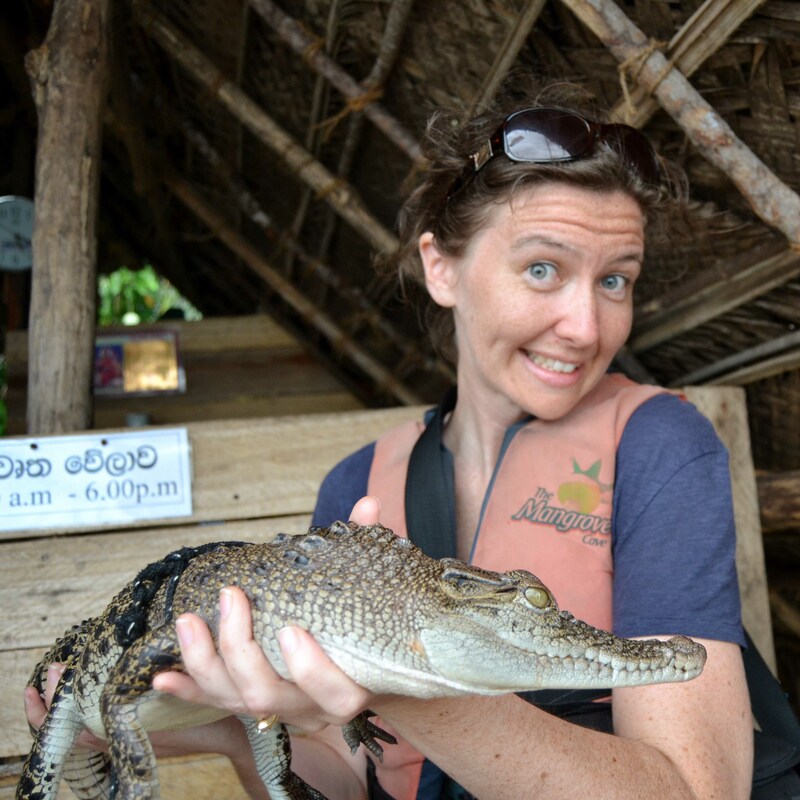 We each took a turn holding the baby crocodile. Oh sure, he seems small, but he looked at me like he was going to swallow me whole. 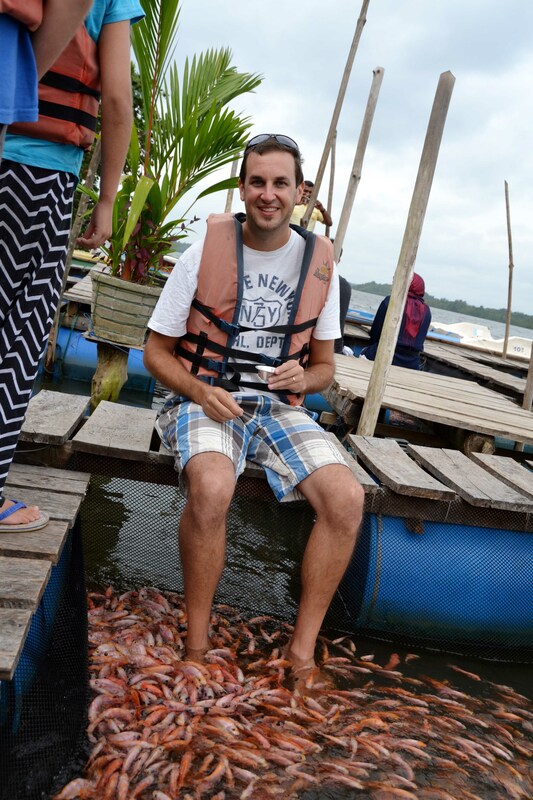 Fish foot massage. Gross! But how could we say no? 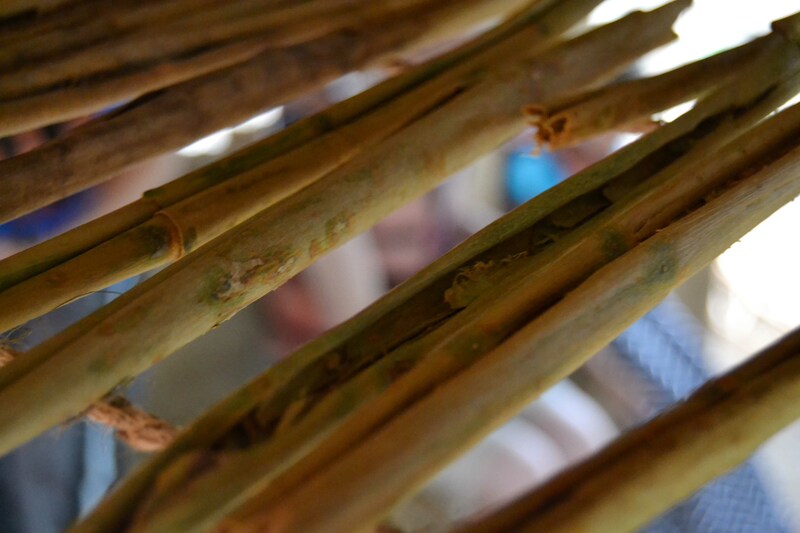 Cinnamon stalks drying out on Cinnamon Island. 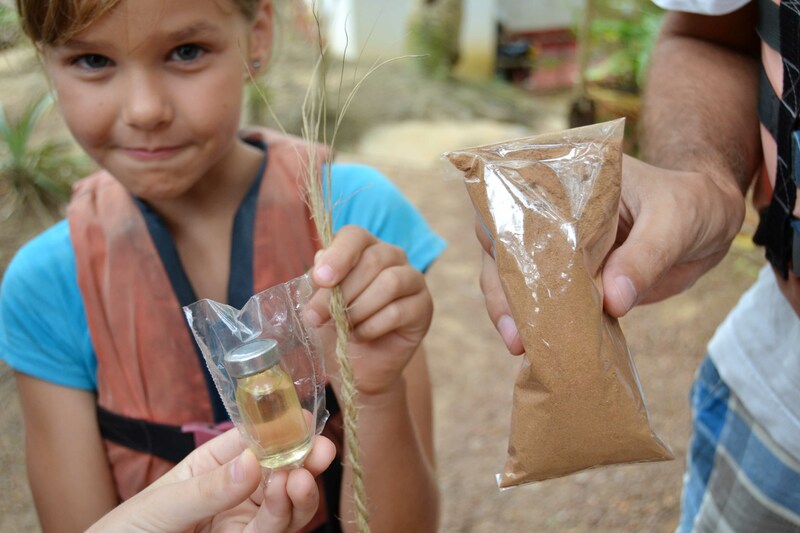 Our take home goodies: cinnamon essential oil, coconut rope, and ground cinnamon. All for $6. Take note, fellow DoTerra lovers: $3 for a bottle of pure cinnamon essential oil! Worth a flight back to Sri Lanka, perhaps? 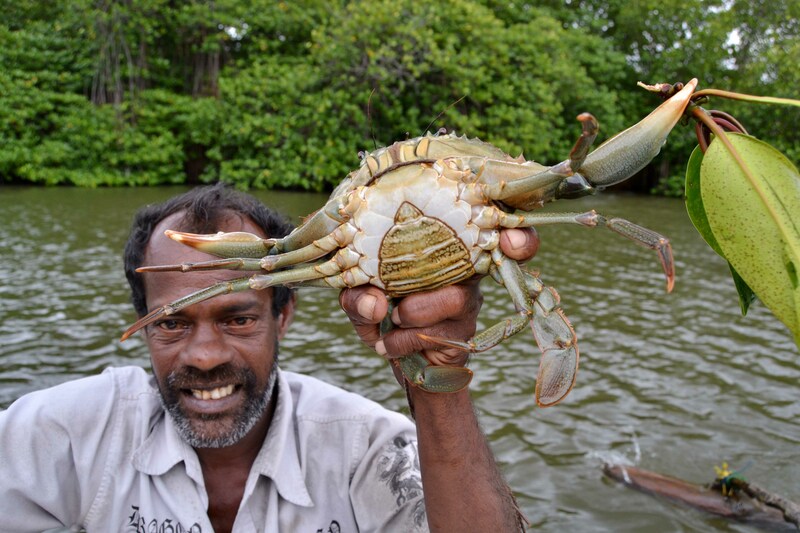 Life on the river. 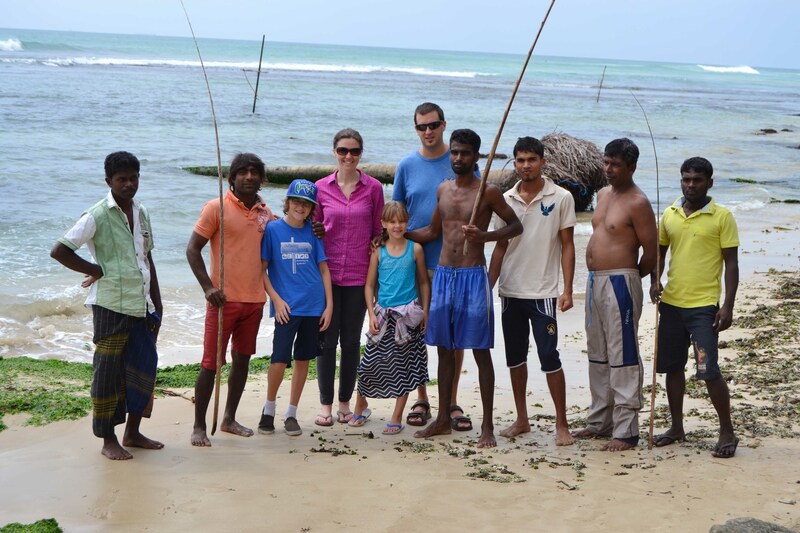 Saying goodbye to Seneca and Sri Lanka at the airport. Our driver made our trip 100 times better than if we’d been on our own. 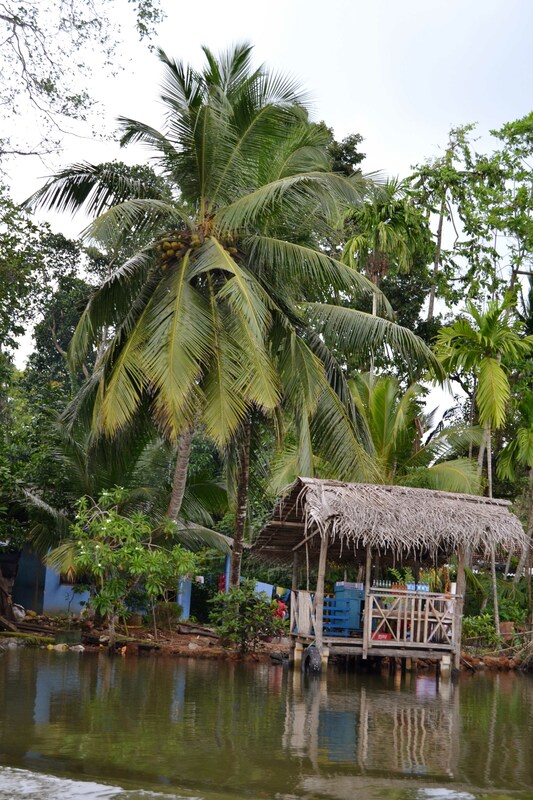 Great suggestions for stops, translating conversations with locals, finding us a new hotel when the hostel was too much, answering our endless questions during hours in the car. It was hard to leave him. But, I was also really looking forward to not feeling damp all the time and sleeping in my own comfy bed, so I pulled myself away. 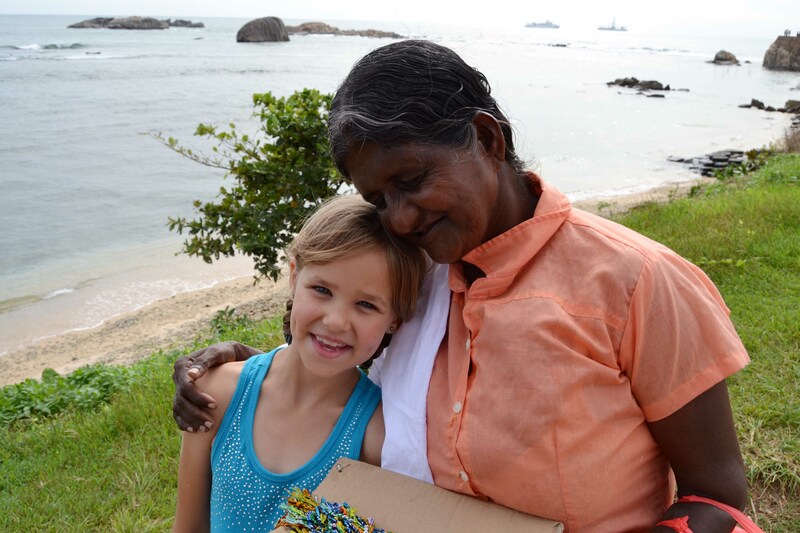 We left Sri Lanka, blessed and changed. 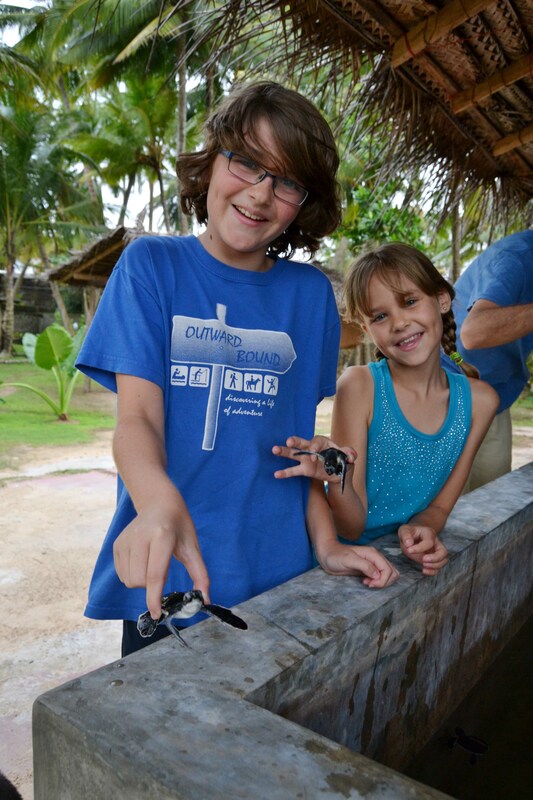 This entry was posted in Living On Mission, Travel Log and tagged Sri Lanka.